When you start eating Gluten Free breakfast can be one of the most difficult meals to adapt to your new diet. Obviously bacon and eggs or a variation of this is fine. If you have the time to make it. When you’ve got 6 minutes to eat in between getting out of the shower and on the bus that just isn’t going to cut it. Luckily there are quite a few different Gluten Free breakfast options available in the UK, this Gluten Free muesli being one of them. This one, made by Eat Natural (who also have a wide range of Gluten Free cereal bars), is their Buckwheat Muesli and a solid choice for a quick, healthy, mid-week breakfast. 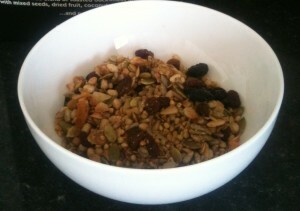 It’s a mix of toasted Buckwheat, Crisped Rice, Mixed Seeds, Coconut and Raisins and Sultanas. Buckwheat, actually not a grain but a fruit seed is a good source of energy and extremely nutritious. It’s been linked to a lowered risk of developing high cholesterol or blood pressure and has a host of other beneficial effects, due partly to its rich supply of flavonoids, particularly rutin. Flavonoids protect against disease by extending the action of vitamin C and acting as antioxidants. 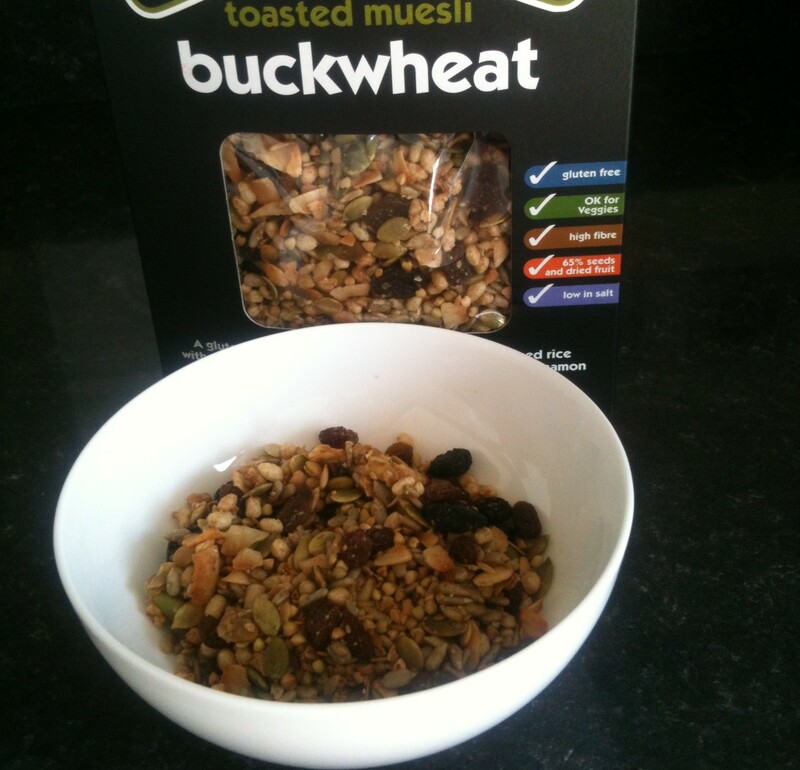 Buckwheat is also high in magnesium which relaxes blood vessels, improves blood flow and lowers blood pressure. All good news for your cardiovascular system. The nutrients in buckwheat may also reduce the risk of diabetes. Buckwheat also scores highly on its ability to satisfy hunger and is a good source of insoluble fibre. You can read more about the benefits of Buckwheat here. The Pumpkin seeds are another good source of magnesium. The Linseeds are rich in omega-3 fatty acids and reportedly relieve menopausal symptoms and constipation. They can also help reduce inflammation and protect against heart disease and some cancers. So its pretty safe to assume eating this cereal a couple of times a week will be good for you but that’s not worth much if it doesn’t taste good. Well.. obviously tastes vary but I think this has no problems in that area. It has sugar, honey and cinnamon added to it but isn’t overly sweet. The amounts of fruit is generous and the individual raisins and sultanas are a good size. The seeds give it a nice nutty flavour and crunchy texture and there is a good amount of coconut which compliments the other ingredients well. This can be a little tricky to get hold of, I’ve found a few of the major supermarkets branches local to me sell it but others don’t so you may have to hunt around for it, alternatively you can save a bit of money by buying it in bulk online. Its nice and crunchy and doesn’t become too soggy when you add milk, if that’s what you decide to do, I usually have it with yoghurt, sometimes with a handful of blueberries thrown on top. Just to get me a bit nearer my five a day. Article posted in Cereal, Products on August 31, 2013 by Ray Smith.